Editor’s note: Those who have been following our blog will know that the MEX Flight Control Team at ESOC have been actively preparing for the flyby of comet C/2013 A1/Siding Spring on 19 October. Initial estimates gave the possibility that Mars Express might have to contend with a large particle flux – and that several (2? 3?) very high-speed (~56 km/sec!) particles might bash into the spacecraft. Happily, additional observations by ground and space telescopes (including the ESA/NASA Hubble Space Telescope) have allowed initial estimates to be refined and the risk is now understood to be much lower – and perhaps even as low as zero. In today’s blog post, the team explain how this (happy!) real-life, real-time development is affecting their preparations for fly-by. Late last year, estimates given in scientific papers estimated that over the duration of the encounter, the number of large cometary particles per square metre would be around 1. As MEX’s area in the most protected attitude is about 3m2, we could then expect about 3 potentially significant impacts. Not good! By the middle of this summer, published estimates (based on new images and additional modelling) were indicating a flux of around 10-6 particles per m2, which, for Mars Express, very roughly equates to a 1-in-300,000 chance of being hit. 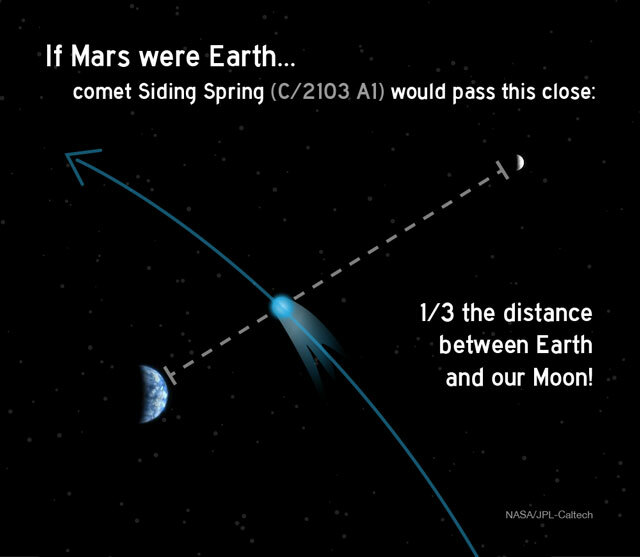 It’s starting to look like our comet C/2013 A1/Siding Spring will manifest itself as a more friendly passer-by than initially thought and that it won’t be hurling clouds of large particles at unthinkable speeds towards Mars and its man-made satellites. No two comets behave in quite the same way, (and they like to give us surprises – such as our sister mission Rosetta’s 67P/Churyumov-Gerasimenko turning out to be a gentle ‘rubber-duck’ shape rather than the erratic potato we expected) so that, as more observations are made, better predictions can also be formulated. As we have the flexibility to wait until the best possible results are available, it is wise for us to do so. As a Flight Control Team, we are rather fond of our little spacecraft, and as responsible engineers, we are accountable for this still unique European asset at Mars. So, as much as we intend it to do its job and collect science, we also do not want to risk unnecessary damage. Hopefully the latest observations will continue confirming that the risk is, indeed, relatively low; but if not, we have a plan and are ready to execute it. Our kind blog readers must be thinking: ‘All this talk of risk mitigation, orbit correction, special attitudes – and now we are talking about a nominal plan all of a sudden!? What does that mean?’ Indeed, up to now, the Flight Control Team has been concentrating on the so-called Contingency Plan – what we should do if we consider the spacecraft to be at risk. Now, with the risk much lower than foreseen, it seems possible that we can get through fly-by with a Nominal Plan – that is, basically continuing what we do every week (and have done for the last 550 weeks) by pointing the instruments at targets of interest and sending the collected data back to Earth. In this case, one of those targets will be a nearby comet but this is not the first time that Mars Express has looked at objects away from Mars (the Phobos/Jupiter video and Earth selfie are just two examples) nor is it the first time that it has looked for a comet (although comet Ison turned out to be less bright than expected). Having two plans fully worked out and ready to go, we can delay our decision on which one to use until two weeks before the encounter at the very latest. 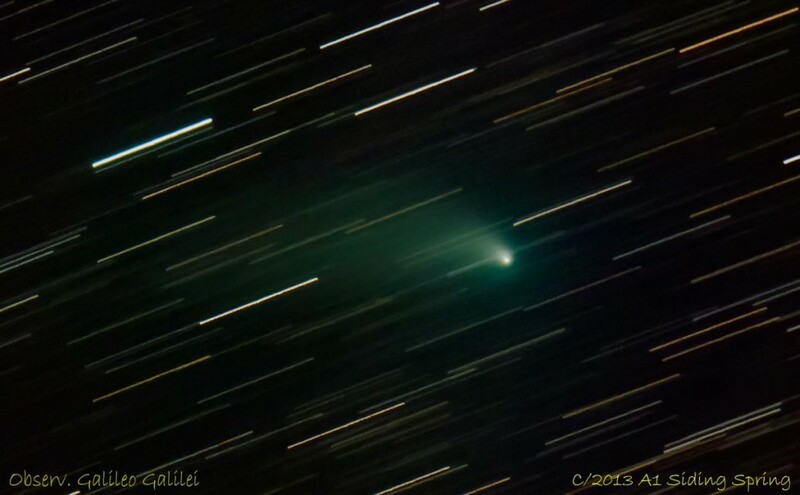 The reason why we wait until so close to the event was explained in an earlier blog post, where we mentioned the difficulties in observing a comet and determining its behaviour. As the comet gets closer to the Sun, the comet scientists can build up a far better picture of how large its coma is using Earth-based observations and therefore what the risk is to Mars Express. Please refer me a place where I could follow the comet’s trajectory thru the constelations. This sites are cool. Thank you.